Ok, as a stay at home mom and a wife…and an extrovert, I have been pretty open about my need to have nights away from the house. Years ago, when we were terrible with managing our money, we made so many excuses why we couldn’t afford fitting a night out into our budget. When we would finally cave, we would just charge our night out on our credit card! Well, I’m here to help you avoid the same mistakes we made. No credit cards, no excuses. 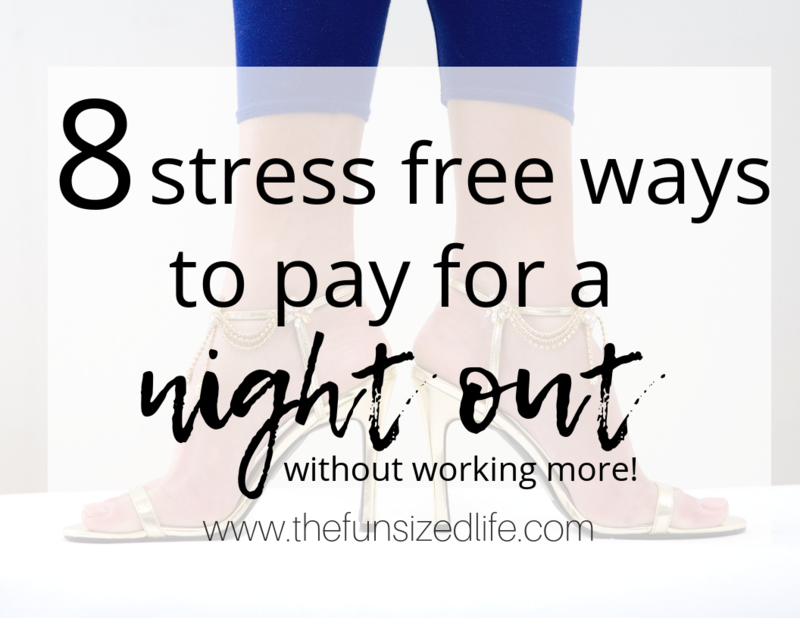 Here are 7 totally stress free ways to pay for a night out without working more! Who doesn’t love gift cards? They are an absolutely “no excuse” reason to spend fun money on yourself. The crazy part is, you could be getting gift cards for yourself at half the cost! Why wouldn’t you spend $10 to get a $25 gift card? No catch! At Restaurant.com you can choose from dozens of different restaurants in your area! You can get $25 gift cards for $10, $5 for $2, $10 for $5… you get my drift. The point is, you can end up saving big time on your night out! Although most places only allow you to use one gift card per visit, this is still a great way to save up to $15 on your night out! Bonus tip! If you are signed up for Ebates (if not, sign up here to get a $10 credit) you can save even more money! Use Restaurant.com through your Ebates app and Ebates will refund you a percentage of your purchase! If you haven’t signed up for Ebates, you will get a $10 credit, plus save $15 on your favorite restaurant! That could easily pay for 2 drinks and a shared appetizer! See Restaurant.com gift cards near you. Sure, you can save your spare change in a jar like grandma did, or you can start doing it automatically with Digit. Digit is an app that reviews your spending habits and will save money for you automatically! Your account will be automatically set up with a “Rainy Day” fund that you can withdraw from any time you want. The best part is, Digit really wants to make sure you don’t ever struggle with a negative balance because after all, this app is designed to help you save money, not lose it! When you set up your account you can also set a limit for your account. Say you’ve set a limit for at least $50 in your bank account, Digit will make sure you maintain that balance at all times! So say your account dips to $40, Digit will take $10 from your Rainy Day account to maintain your $50 balance! At the end of the month, you can easily take any Rainy Day money you have left (or your $50) and start planning a night out! Start saving automatically with Digit. If you’re not up for saving automatically, you could just save the old fashioned way, with sinking funds. This is a great way to be in total control of your money and to only spend a little bit at a time. With sinking funds, you could easily put $20 into an envelope every month for 3 months and then have a $60 stash all set for a night out! That could easily be enough for 2 movie tickets, a bucket of popcorn and a sitter for the kids! The 50 Most Requested Copycat Recipes. Stop Eating Out and Save Money! For us, when I was a stay at home mom with two young kids, this was probably the toughest time for us to find a way to pay for a night out. On top of that, being a stay at home parent can often make you crave a night out more than ever. Lucky for me, during those times when I felt a little stir crazy, I had Facebook on my phone (it was a big deal back then.) So I had some form of communication with the outside world. Today, it’s no secret that you can do just about anything from your phone. If you have times where the kids are napping, while nursing or even 5 minutes before bed, try taking a survey. Survey sites like iSay pay you for your time with gift cards! Like I said, you can’t use gift cards on paying the bills! You are absolutely forced to treat yourself. While iSay is probably my favorite survey site to use, there are tons of others that pay with actual cash or gift cards. Check out some of these other awesome survey sites. One of the best ways to come up with extra money without working is by reviewing your current spending habits. When Tom and I struggled to manage our finances better, we would often say we were “broke” or “poor” when in reality we had spent over $500 on small, insignificant and unplanned purchases. Go through your account and add up any purchases you made that were unnecessary. Things like alcohol, fast food, and even things like clothing you didn’t really need or didn’t plan for. How much extra was there? Doing this might give you an idea of how much money you could be budgeting to help pay for a night out. Speaking of over-spending on alcohol. Did you know you don’t have to do that anymore? One of the best ways you can save on a night out is to avoid getting drinks. That’s probably common sense. So if you’d like to have a night cap at home after your night out, why not save on that too? With the Ibotta app, you can save on a wide variety of different alcoholic (and non-alcoholic) beverages! If you haven’t already signed up for Ibotta, take advantage of this $10 credit by signing up now! Don’t worry, Ibotta doesn’t only benefit you when it comes to saving money on alcohol. You can use the app for all of your regular shopping purchases as well! See how it’s done. Let’s face it, paying for the babysitter is probably one of the most expensive and stressful parts of paying for a night out. I used to joke that this is why I married a guy with 2 older daughters. Of course, we didn’t always rely on them and for a while, they weren’t old enough to be home with the younger two either. When it comes to babysitting, you might have to get a little creative. One of the best ways to do this is to “swap babysitting” with another couple. Friends, neighbors or people in your mommy and me classes are a great start. Sure, this means you’re agreeing to taking on extra kids one night of the month, but they usually end up entertaining each other. So…it could even be seen as a bonus night out? Maybe. No. Too far? When I was a first time stay at home mom with a baby, I spent a lot of my free time walking around Target. I don’t think I’m the only mom who has made a habit of this. It was just what I did when I was bored. Maybe this has something to do with why we were to far into debt a few years ago? Nah. The great part about this is, you can now get paid after you shop. It doesn’t matter what you buy either! National Consumer Panel will actually pay you to scan your purchases after you’ve made them. They do this so they can get a better idea of consumers needs and they are willing to pay you to help them out! This might take a little extra time after each time you shop, but if it helps you to pay for a night out, then it’s totally worth it! No matter what, make time! No matter how you do it, or what money saving tactics you use, make sure you are making time for a night out with your spouse or on your own. It is crucial to recharging your batteries and helps you stay on top of your parenting game!